Sambalpur: Corruption in the society can effectively be reduced by following a timeline in personal and work life, said Mr Justice Satish Kumar Agnihotri, former Chief Justice of Hon’ble High Court of Sikkim. Mr Justice Agnihotri was speaking on “Eradicate Corruption-Build A New India” at the inaugural ceremony of Vigilance Awareness Week 2018 at Mahanadi Coalfields Limited (MCL) here last evening. “Over the course of 50 years there has been a big change. Much conduct which was legal a generation ago is now termed as corrupt. Yesterday’s honest theft is today’s illegal conflict of interest. “A gift was not a bribery at one point of time, now in such gifts there is an intent to corruption,” said Mr Justice, sharing his experiences in Indian context as a keynote speaker and chief guest on the occasion. Terming corruption as a multi-faceted and global phenomenon, Justice Agnihotri said: “If you follow timeline, then half of the corruption is over.”It would not possible to eradicate corruption completely from the society, but following a timeline would certainly reduce the possibilities of its occurrence, the Justice remarked. Mr M P Jaiswal, Director, IIM Sambalpur, Ms Yogmaya Agnihotri, Senior Advocate, Hon’ble Supreme Court of India and Prof (Dr) Noorin Khan, senior faculty, Jamila Milia Islamia University, New Delhi also shared the dais as honoured speakers on the occasion while Mr J P Singh, Director (Technical/Operations) presided over the function. Chief Vigilance Officer Mr Munawar Khursheed, IRPF, gave an account of vigilance activities and achievement of the company in ensuring transparent work culture. He appreciated role of the Coal India’s Chairman, MCL’s CMD and Directors for their proactive actions in creating a transparent work environment. 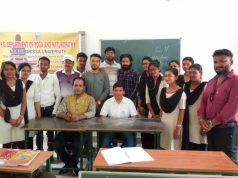 Mr L N Mishra, Director (Personnel) and Mr O P Singh, Director (Technical/Projects & Planning) of MCL also spoke on the occasion, which was attended by a large number of management students from IIM Sambalpur, adding a unique feature to the event. Earlier, Ms Yogmaya Agnihorti along with Prof Khan and vice-presidents of Jagriti Mahila Mandal Ms Paramjit Kaur, Ms Madhoo Mishra, Ms Naushina Afrin Ali, Ms Padamja Singh and Ms Padmini Vasudevan flagged off “Vigilance Rath”, a visual and musical initiative to spread awareness on fighting corruption in the peripheral areas. The dignitaries also released a wall calendar, having cartoons as mode of communication to fight against corruption. A vigilance bulletin and reprint of vigilance manual was also released at the inaugural ceremony, which was conducted by Mr OP Mishra. Meanwhile, Ms Sushmita Sahai, Deputy Manager (Personnel/EE) administered the Vigilance Pledge to all the participants at inaugural ceremony, which concluded with National Anthem after the vote of thanks by Mr Bromio JA, Deputy Manager (Personnel/Vigilance).